I mentioned last week that I was smitten with apples and my love of the fruit is still holding strong. 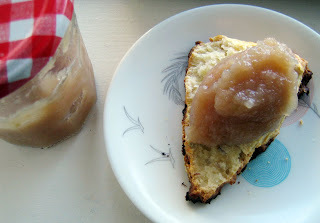 I’ve been snacking all week on the delicious Newtown Pippins that I purchased at the UBC Apple Festival but after spying this recipe for Maple Apple Butter at Aimée’s blog, Under the High Chair, I knew that it was time to get those apples into something new. Apple butter! It sounds more decadent than it really is….but it is luxurious, nonetheless. I remember making and eating butter as part of a grade three class activity and that delicious memory has stayed with me. Aimée’s recipe requires preserving and while I have neither the counter space or the equipment for such an endeavor, I decided to make half the recipe so that it could keep quite comfortably in the fridge. While my apple butter didn’t turn out quite as dark as I remember it being from my elementary school days, it is still thick, spicy and just the right amount of tart. You could definitely increase the maple syrup to increase the sweetness, but I like it just as it is. It’s delicious spread over a homemade scone for breakfast and it makes for a lovely late night treat by the spoonful. Want to read about my adventures at the apple fest? Check out my new post at the Food TV blog, Food for Thought. As an added treat, you’ll even catch a photo of me mugging it up for the camera. Oh boy! 1. Cut apples into quarters. Add apples, juice and cinnamon stick into a pot. Simmer until the apples become soft and fragrant, about 25 minutes. 2. Remove cinnamon stick and reserve. Put the mixture through a strainer to remove seeds and peel. 3. Return the apple puree and the cinnamon stick back to the pot and bring to a boil. Reduce heat and simmer for another 30 minutes stirring occasionally until the mixture thickens. Add maple syrup and cook for another 20 minutes. Remove from heat and cool. This should keep in the fridge for 4 weeks. p.s. The dark amber maple syrup from the Mennonites that I purchased is just what this apple butter needs. I do absolutely love Apple Butter. I live in the heart of Amish Country where it’s served with almost every meal, and I’m grown to love it. This looks like a great variation! Yum! We always have apple sauce with roast/pot-roasted pork and I think this would do the trick as shop bought apple sauce is always too sweet/sticky. Apple butter is something that we just don’t have over here in Ireland or the UK. But I’m intrigued to try it, as I love, love, love (and love) apples and cinnamon in any shape or form. Looks delicious! Oy oy, that looks good!!! Apropos them apples, do you happen to have a juicer? I finely grated some apple yesterday to put in some of my alternative meatballs. I squeezed it well, caught the juice in a cup, and my oh my. Fresh apple juice is to date the most quenching beverage I’ve ever tried. Hi there, I have a question about the ricotta orange pancake. It sounds delicious. I am allergic to eggs, so is there an eggless variation? sounds yummy and fairly easy, especially considering i am pureeing everything for my son’s baby food these days! 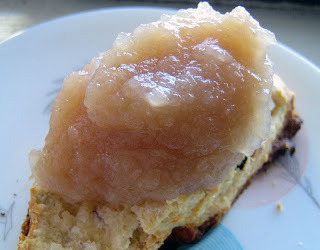 Wonderful job on the apple butter recipe–it reminds me of the type of apple butter I had years ago at an Amish restaurant in Pennsylvania. Apple butter is one of those things that never seems to impress me…but this recipe is intriguing. I might give it a whirl. looks delicious. I’ve never heard of apple butter before but it looks simple enough so I’ll be giving it a go. I love apple butter! It is great over ice cream too! It makes the house smell so good while it is cooking! I sneak it into my baked goods too in order to cut back on fat! Yours looks so good! fab recipe, fab blog. looking forward to following along. i was in philadelphia recently and saw amish tomato butter. forgot to buy some though, but it does make you think about what else might benefit from the same cooking technique. veggiegirl, the maple flavour isn’t that strong, but it’s still a great recipe. wow, i had no idea that apple butter was so rampant! i might just have to check out Amish Country sometime! thanks fiber. this would be great with a dark maple syrup, joanne! 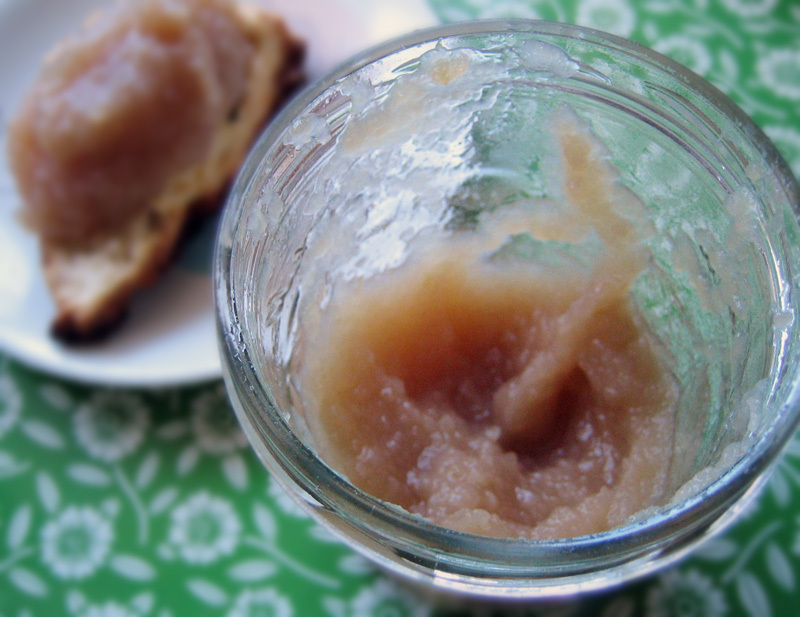 le laquet, apple sauce is so easy to make – i never buy it anymore. karina, this is a pretty great recipe. i hope you try it out! jennie, i don’t have a juicer but i bet your homemade cider rocks! jen, this is delicious and super easy to make. try it out! larissa, if you don’t like apples or apple sauce, you probably won’t like apple butter, but you should give it a try anways! caty, it is simple and easy to make. give it a go! thanks kyla! tomato butter sounds incredible. definitely something to try! sarena, over ice cream sounds fab. it can definitely be added to baked good too!